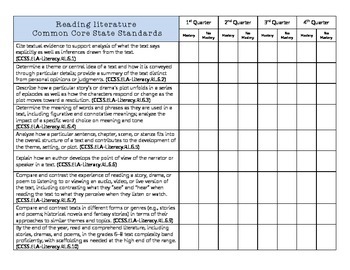 This FREE digital download is a table I created to help me keep track of my student's mastery of the reading literature common core standards. I have listed the nonfiction standards for grade 6 on the left hand side and across the top I have eight boxes, two for each quarter, for you to use to keep track student performance. This table can be used to track class performance when you fill in data about the number of students demonstrating mastery or you can use this sheet to track performance of individual students. There are FREE versions of this chart for the CCSS reading literature standards for grades 7 and 8 as well. A great way to practice the Reading Literature standards on this chart is with the Reading Journal Bookmarks with Writing Prompts. They can be used with any fiction text! You can also track your student's mastery of the Common Core Information Text standards with this free digital download. It is also available for grades 7 and 8!